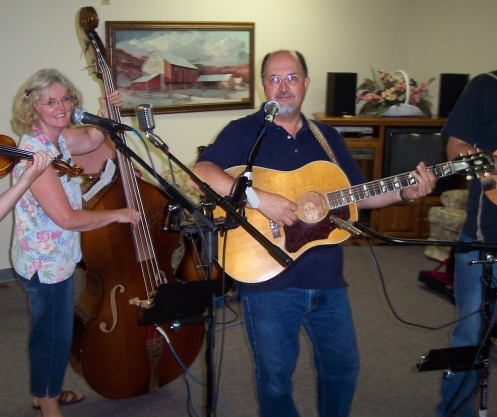 Eldon and Ann during a live performance at a community center. Eldon & Ann are very busy people. Eldon sings and plays a number of instruments including: Guitar, Mandolin & Dobro. Eldon also designs and builds instruments as well. Ann sings and plays the bass & guitar. They perform with a number of different bands, Eldon is a published author of the definitive book on Gibson guitar history. They operate Queen Anne's Local Music News and Queen Anne's Used Instrument Listing. THE WHITFORDS: Just Ann & Eldon doing an acoustic/vocal duo. Ann plays upright bass & high strung guitar & Eldon plays guitar. They perform a wide variety of roots and old country music. KEEPING IT COUNTRY: Their newest band is a four piece 1950-60s old country band. All four members share in the lead singing. Instruments are typical of a 50s country band. Band members include Mark Ray on double neck steel & Dobro, Bill Squires on flattop, Ann on bass & Eldon on electric guitar.